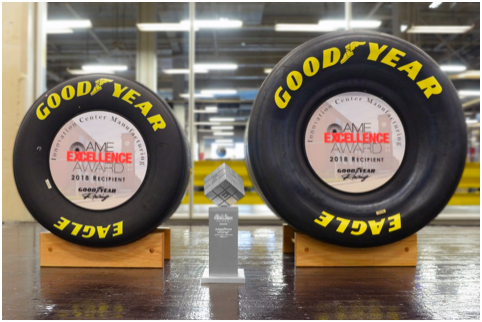 In October 2018, Goodyear ICM (Innovation Center Manufacturing), also known as Goodyear Racing, received the AME Excellence Award for enterprise excellence, an incredible achievement for any organization. This is great news…but let’s take a step back in time to 2013 when Goodyear Racing division had the worst safety record in all of Goodyear and was labeled as having the worst union relationship among Goodyear plants. Salaried associates considered it one of the worst places to work. No one wanted to be transferred there. Production associates had given up hope. Trust was non-existent on all fronts. You guessed it – there’s a great transformational story to share here! In my recent article, “Culture or tools, which comes first in a lean implementation,” I shared how the packaging division of Barry-Wehmiller took steps to reduce fear in the organization and also about the pervasive sense of joy that I observed at Cambridge Engineering. 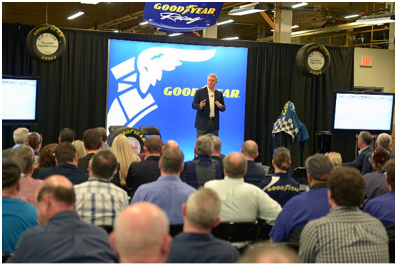 Goodyear shows us another culture that sets a foundation for deep and sustainable success. Goodyear Racing is the remaining manufacturing unit at the Akron, Ohio headquarters of Goodyear and is the exclusive supplier to both NASCAR and NHRA. When you’re the only supplier of tires for two prestigious racing circuits, the pressure is on to produce a quality tire to the highest level—week in and week out. Every racing crew that runs the track each week is depending on it. The team leading the Racing division began the transformational journey in late 2013 by asking themselves questions like: Why can’t we be the plant where people want to work? Why can’t we be the choice for tours right next to corporate headquarters? Why can’t we be the plant that demonstrates lean practices and sends out disciples? Why can’t we brand the Goodyear name? Why can’t we be a united team with our union associates? And at the executive management level, leadership was challenged to create something that was not only transformational, but that was enduring and would carry on through the greater test of leadership changes. There was one statement that rang true throughout all of this – the associates at the Racing division were incredibly proud of their work. In the spirit of doing something different, the leadership team partnered with the Goodyear Marketing team to produce a 30 second TV commercial that linked the Racing division’s craftsmanship with Goodyear’s “Battle Tested” NASCAR branding. Associates were the feature of this TV spot, which aired on prime-time TV, and was also shown in Goodyear Service Centers across America. The commercial became the defining moment as the Racing division’s pride was on display via national television and the journey towards operational excellence through an engaged workforce had begun. The leadership team realized that it was vital to show employees that they were valued and respected. When asked how you show respect for people, the response was, “Listen more, talk less, raise the standard on how we treat each other, act on associate input and ideas, include associates in the business and make respect the cornerstone of the culture.” They committed to focusing on establishing a winning culture first and then implementing lean tools as they earned the cultural right. I asked about this concept of earning the cultural right to implement lean tools. While the concept was never defined by a metric, it was understood as the pace at which they could successfully implement new systems or processes while sustaining the gains of previously introduced lean tools. They verified with the employees through this culture of respect that they understood and embraced each new lean tool before it was implemented. This forward thinking concept allowed the employees to pull in new systems and processes based on their readiness to sustain the last set of improvements. As far as the culture, the starting point was to align around safety first. What better way to show respect and to develop trust than to show you truly care by insuring that employees go home the same way they arrived to work each day? They developed the Home Safe program, in which every associate was empowered and given the responsibility to stop any process and remain safe. The message to all employees was safety before production. As part of the Target Zero process, associates documented safety hazards or near misses. They filled out cards that were displayed on boards for full transparency until the fix was implemented. They also implemented a series of safety classes – Safety 101 and Safety 201, encouraging a safety-first mindset. When a safety incident occurs, leadership launches an investigation into the injury, even for smaller ones. After the investigation is complete, a safety stand down is held and all the team members (hourly and salary) are invited to a meeting at the area or equipment where the injury occurred. A packet of information is provided describing the details of the injury and/or showing photos of the equipment. Associates are then invited to ask questions and offer suggestions to prevent a similar injury in the future. The safety-first mindset was married to a quality-first mindset, and correspondingly, every associate was empowered to stop the process to ensure the production of a quality product. And like the safety side, quality stand downs are also held around areas where there was excess waste or if a defect was found in a product. The concurrent challenge to the leadership team was to become partners with the union, in this case, the United Steel Workers (USW) union, where there was a 97-year history. While trust was slow at first, the USW is clearly an integral contributor and partner to the success at the Racing division. In late 2017, the Racing division welcomed a team from the United Steelworkers Headquarters office and joined together to create a video featuring the associates and the pride they take in their craftsmanship. The video has been dubbed within Goodyear as “ICM Pride” and can be found on YouTube under the name “Goodyear: #USWMade NASCAR Tires.” Two of the four Goodyear representatives who accepted the AME Excellence Award were senior union leaders, and all four representatives proudly wore shirts with both the Goodyear and the United Steel Workers logo’s stitched in. While performing the site assessment for the AME Excellence Award, AME’s team of assessors noted what we call “the pearls of excellence” or best in class practices. They noted that the “people-first” culture and the safety and the quality programs were all best in class. Assessors also noted that each of these handcrafted racing tires contain a yellow sticker that is placed inside the tire stating “Proudly Built By _______” with the employee’s name. This allows the company to track who builds the winning set of tires for the NASCAR races so that the associate can be recognized. The phrase “All Encounters Matter” was developed to help all associates contribute to the building of the Goodyear brand, whether the encounters were internal or external. NASCAR teams began to visit the Racing division and the hourly associates, who excelled as ambassadors for the Goodyear products, were the primary focus of those interactions. It was shared that some of NASCAR’s most critical drivers changed their mindset after interacting with the Racing team. There are also excellent employee recognition programs in place. To be eligible to win recognition awards, associates must participate in the target zero and/or continuous improvement process. For each submitted target zero or continuous improvement card, associates receive a raffle drawing entry for a Blimp ride. Five associates yearly are awarded a Blimp ride. Collectable coins are also awarded to recognize ideas in the continuous improvement and target zero processes. Each year, the company and the union leadership teams select a group of six to eight associates to send as ambassadors to the Daytona 500. This fully organized experience includes time off, hot passes for themselves and a guest, transportation and food and lodging. Four times annually, the Racing division presents certificates to the tire builders of the tires that are on the winning cars of the Daytona 500, Kentucky, Charlotte and Homestead Miami races. The Racing division also provides an annual opportunity for all associates and their families to receive tickets and hospitality for the race held at the Kentucky Speedway. Other recognition awards include luncheons for achievements (going a year without a recordable injury) or gift cards for stopping the process for a safety or quality related issue. Beyond these “pearls,” the division was recognized as having best in class practices as it relates to health and wellness, coaching and ergonomics. And with the third senior site leader now in place, the Racing division has achieved perhaps the most important “pearl” in that they have created a transforming culture that has proven to be enduring and sustaining through the greater test of leadership changes. It has been an incredible journey for this site. I have had the pleasure of touring and interacting with this team four times in the last year and a half. After my first tour, it was clear that there was something special going on at Goodyear Racing. Prior to my third visit, I was in process of setting up an executive leadership summit for the leaders of our Cleveland-based consortia, of which Goodyear is a member. We had arranged for three speakers to discuss more strategic level topics including mission driven focus, people-centric leadership and enterprise excellence. However, I wanted these leaders to not just hear about excellence, but to see it in action. The Goodyear Racing division was kind enough to host our event, and the final two hours of the day-long summit was spent touring and seeing these practices first hand. The site tour was one of the most highly rated aspects of the summit. Thanks to this fine team for opening its doors and allowing our AME members to experience this amazing transformation in person. This article is the second in a series on cultural transformation. Do you have a culture story that you would like to share? I would love to share it with our AME community and beyond! Please contact me at gsaiz@ame.org. George Saiz is President and CEO of Association for Manufacturing Excellence. Learn more about developing your culture and implementing lean tools at ame.org.